Welcome to Strike Lightning, the best place to buy or sell a used Dyna Super Glide. Scroll down to see our inventory of cheap, used custom Harley Super Glides for sale by private owner or to advertise your own Super Glide for sale. As a rule, we usually feature listings for privately owned motorcycles but if you are a dealer, we will accept your listings providing that you include a complete description of the motorcycle for sale of at least 250 words in length or more and a color picture of the bike that you have for sale. If you don’t have a Harley for sale but would like to sell some of the custom parts you never got around to installing on your bike (we‘ve all been there), we may be able to help you out. If the parts are specifically for a Harley Super Glide, go ahead and advertise them on this page if you like, but you might get better results if you post them in the used motorcycle parts classified ad section; I’ll let you be the judge on which category suits you best. To get more details on how to get the best results from your motorcycle classifieds, please scroll down the page to read our instructions. 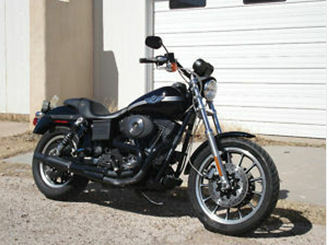 Go Here to See More Harley Dyna Super Glides for sale by owner. If you are looking for a used Harley Super Glide for sale to buy and this is your visit to Strike Lightning Motorcycle Classifieds you should take a minute to learn how our classifieds work, don’t worry it’s really very simple. When you see a used Harley Davidson Super Glide for sale that interests you, read the classified to see how the seller prefers to be contacted. Some sellers list a phone number and other times they indicate that they would prefer to be emailed. If you would like to communicate with the owner of a Harley Davidson Dyna Super Glide that strikes your fancy, all you have to do is click on the COMMENTS link found at the bottom of the classified ad and type your questions, requests and your own contact information in the form. When you finish send the email and the owner will respond in whatever way you specified IF the Dyna Super Glide is still for sale. All of the sellers post advertisements on Strike Lightning are supposed to let us know when they no longer have their used Harleys for sale but sometimes they simply don’t let us know so don’t get all mad and huffy at me if they don’t email or call you back. Here is the best way to advertise your Harley Dyna Super Glide for sale that will get you the best results from your classified ad. A detailed description of your used motorcycles for sale using good grammar (PLEASE DON’T TYPE IN CAPS and spell check your ad) is very important. List as many details regarding the Super Glide as possible including the year it was manufactured, a list of any accessories that you may have added during your ownership (and any factory parts that you kept that will come with the motorcycle), plus any helmets, saddlebags or gear that you are including in the deal. THEN, you should take pictures of the Harley Dyna Super Glide for sale from different angles that feature its best side (if it has one). You are allowed to upload as many as four photos of the motorcycle (or just one if you think that’s all you need). You can post an ad without photos, but if you choose to do so you should expect to get lots of (negative) comments from potential buyers that want to know why there are no pictures on the ad! When you are done you can push the button to preview your classified to be sure that you didn’t forget anything and then you can push the button to submit it. I recommend that you check the box that pops up after the preview indicating that you would prefer to ONLY to get comments when potential buyers comment.